I just share my experience which I got while doing the development to send the payload (Text file) as attachment with SMTP adapter at the receiver communication channel. This blog explains how the XML to plain text file conversion and attachment name change can be achieved. The main part explained here is, XML to flat file conversion and payload name change. Please note that this document explains only about the important configurations. Developer should have basic knowledge on PI ESR and ID developments. Below is the channel parameters to get the file name “NGC.txt”. Select the “Keep attachments” check box in the receiver communication channel. Usually, file name can be changed using java Code (UDF) with dynamic configuration related API or logic. This file name change works only if we don’t use content conversion. Note: If we combine dynamic configuration UDF and content conversion modules in the CC, dynamic text file name is not working (File name will be always MainDocument). 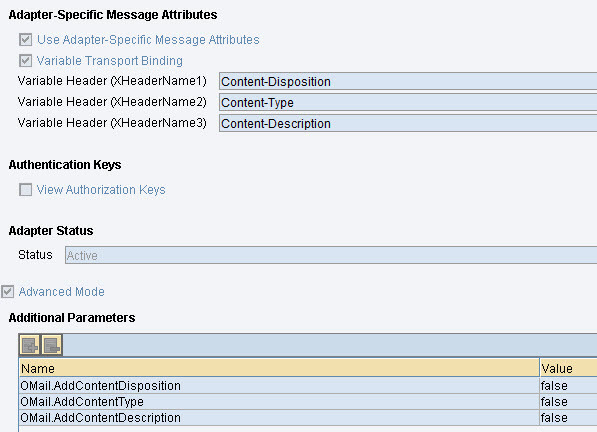 Use the mail package external definition file as the target message type (Attached in this blog). Here, prepare the flat file records and assign fill it to content fled of message (separated with the character ‘\n’ for the new line). Select the “Use Mail Package” and “Keep attachments” check boxes in the receiver communication channel. i have a following scenario: XML to Mail as csv attachment. I have set up the scenario and it works if is use transform.content type as a static file name but when i try to rename it using FIleName from asma nothing happens eventhough the message monitoring says it change the name of the attachment. I want the Attachment.xml to be renamed with ASMA FileName. In the “Advanced” Tab, select the check box “Variable Transport Binding” and fill the variable header fields as I mentioned in the blog…. And also, select the check box “Advance Mode”, and provide the Additional parameters as I mentioned in the blog.. I tried everything in this post from before but it doesn’t work on 7.4 SP12. or maybe some documentation elsewhere? I tried the above scenario and it doesn’t work in PO 7.5. Is there something missing in the product to enable this functionality? I have also tried to use a Mail channel with Content-Disposition and Content-Type. But the Content-Typ at the mime Header of the mail is always the wrong. The Content-Disposition, I set via UDF is the correct one. I set the Content-Type in the mapping with UDF. then the Content typ at the mime Header of my mail is correct. But how could I get the header variables to the mime Header?